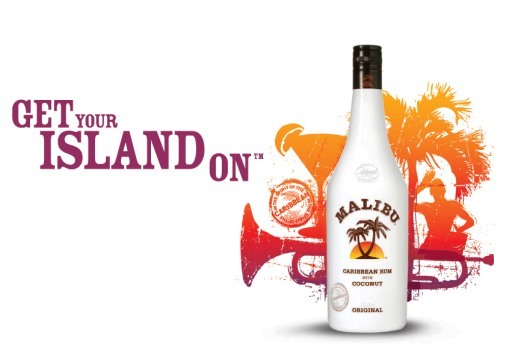 Get Your Island On, an online Malibu rum experience, is today’s site of the day. The site is part of an overall campaign developed by Droga5 for the coconut flavoured rum, operated and marketed globally by Malibu-Kahlúa International, a unit of Pernod Ricard. Visitors to the site find themselves floating in the water, looking at a sand and palm tree backdrop. Look out for the flying coconuts over and around the island. 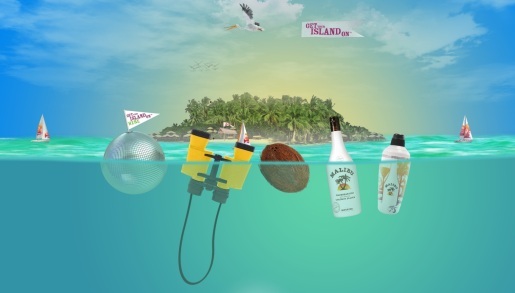 Floating in the water are icons that take visitors to the various features: a disco ball (news and downloads), binoculars (print and TV advertising), a coconut (brand history), and Malibu bottles (products and drinks). Site users have an opportunity to have a drink poured by a virtual bartender. There’s a link to the Malibu Yahoo Video channel where users can ‘get their island on’ by contributing their own videos. The interactive site is part of a campaign created by Droga5 and Publicis, launched in December 2007 with two television commercials, Flip Flop Man and Flip Flop Woman. The two television spots are set in a city where people have tapped into their Caribbean mindset, which has affected their behavior. As the main character bicycles through the streets in both executions, he or she sees people going about their usual routines with a Malibu attitude represented by their choice of footwear: flip flops. From a light-hearted television reporter taping a segment to presidential bodyguards tossing a frisbee, each character embodies the concept of “Get Your Island On” by injecting the infectious spirit of the Caribbean into their everyday life. The spot culminates with a vibrant rooftop party with a tropical island atmosphere. Filming was shot on location in Buenos Aires by Black Dog director Albert Kodagolian via Park Pictures, New York, with director of photography Daniel Bronks. After auditioning dozens of professional actors, Kodagolian and team discovered the commercial’s male lead at a local bar. Huibert Christiann de Leede, a Dutch business consultant, was traveling across South America on holiday. De Leede embodied the Malibu spirit with his confident, easy going attitude and was a natural on set alongside the female lead, Pilar Lireta, a professional actress from Argentina. The Malibu Get Your Island On site was developed at Firstborn by creative director Joon Park, executive producer Dan LaCivita, senior producer Avery Holden, lead designer Jennifer Xin, lead developer Zeh Fernando, software developer Ryan Jafari, 3D/motion designer Jennifer Xin, 3D/motion designer/editor Eric Eng, editors Michael Kuzmich and Susannah Averpil.